When spring came, half of the deer set off to the north. The animals crossed sand dunes and sagebrush-covered mesas, traveling some 40 miles until they reached an area on the southwest edge of the Wind River Range. They didn’t stop there. The deer worked their way along the foothills of the range over the next several weeks, traveling some 60 miles. They spent 95 percent of their time at “stopovers” — foraging areas that provide rest and recovery from the hungry winter months. At each step the Red Desert deer grazed on the first shoots of green grass, mingling among 4,000 other deer that winter in that area. The whole herd continued moving north and up to higher elevations as the snow melted, following the “green wave” of lush forage. In time, the Red Desert deer reached the Finger Lakes east of Pinedale. They crossed an outlet below Boulder Lake. Some swam across Fremont Lake before making their way out of the Green River Basin. 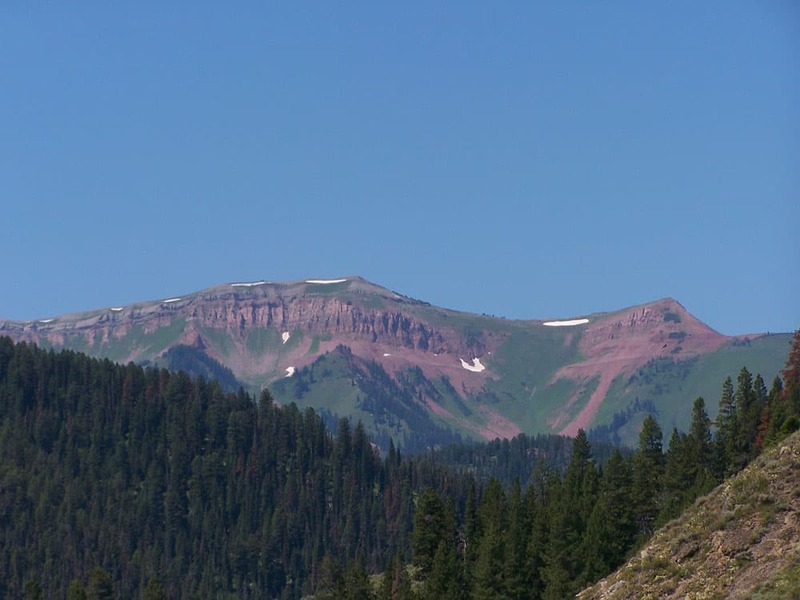 By late July the Red Desert deer migrated into the Hoback Basin and up into the mountains, traveling up to 50 miles more. Some climbed into the Wyoming Range and the Snake River Range. Others moved above timberline in the Gros Ventre Mountains. As the August sun dried out the grass in the valleys below, the deer were still grazing on lush spring grass emerging from the melting snow above 10,000 feet. All the while, Hall Sawyer and his team were tracking the progress of the deer by locating their radio collars with occasional fly-overs in a helicopter. When they gathered the collars from the field in 2013, the GPS data showed that the mule deer migration traversed 150 miles from the Red Desert to the Hoback. They had discovered the longest ungulate migration ever recorded in the lower 48 states. The discovery of the long mule deer migration adds to the growing body of migration studies coming out of the University of Wyoming’s Cooperative Fish and Wildlife Research Unit in Laramie. The so-called “co-op unit,” led by biologist Matt Kauffman, has produced a series of groundbreaking studies on the behavior of migrating animals in western Wyoming. In the past 15 years, advances in GPS technology have enabled Kauffman, Sawyer, and a team of graduate students to trace the mysterious movements of large mammals across the landscape. They have studied migrations of moose in the Wyoming Range, bighorn sheep in the Tetons, and elk in the Greater Yellowstone region, among other projects. Critically, migrations allow animals to maximize access to the most nutritious feed right after “green up,“ when plants first emerge in the spring. Rather than eating spring forage for just a few weeks in any one place, ungulates can make the season last for several months by chasing springtime up to higher elevations. It’s as if they follow a moving oasis. At the same time, migration allows animals to reduce the risks of drought and harsh winter weather by moving to places with better conditions. It’s much easier to winter in the dry Red Desert than in five feet of snow in the Hoback Range. 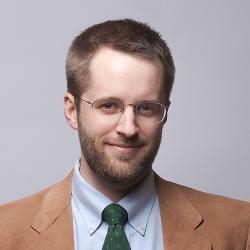 “It’s this optimization or evolutionary process, where over hundreds or thousands of years they are figuring out the best place to go,“ Sawyer said. 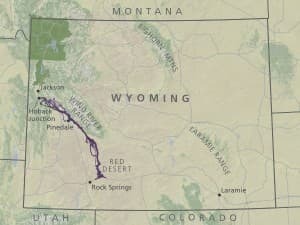 Perhaps most widely known migration in Wyoming is the “path of the pronghorn,” a 120-mile migration from the upper Green River Basin to Grand Teton National Park. That route, first traced in a study by Sawyer and subsequently documented by writer Emilene Ostlind and photographer Joe Riis among others, was thought to be the longest ungulate migration in the lower 48 states. The revelation that mule deer from the Red Desert travel even farther than the pronghorn opens up a new chapter in the story of Wyoming’s unique migrations. The discovery comes at a crucial time when mule deer populations are dropping. On April 22, Kauffman and Sawyer are hosting an opening of a photography exhibit at the Berry Biodiversity Conservation Center at the University of Wyoming. 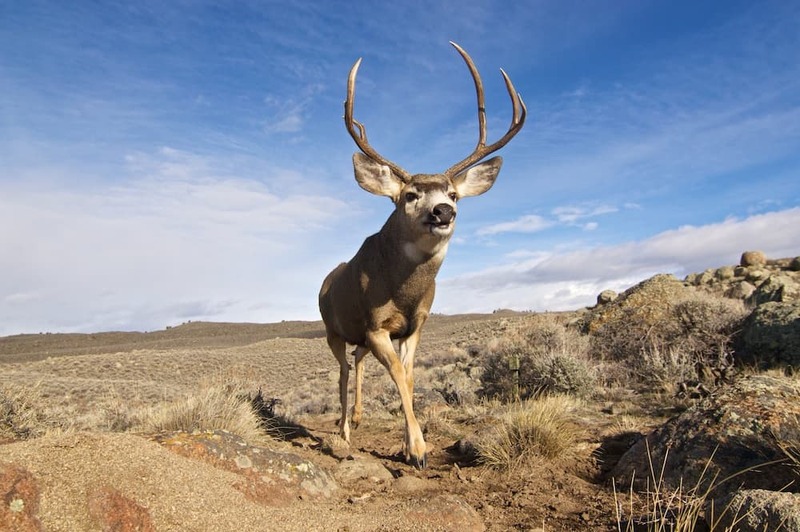 The exhibit features images by Joe Riis showing the journey of the Red Desert mule deer and the obstacles they face along the way. The event coincides with the public launch of Kauffman and Sawyer’s Migration Initiative, an effort to share the science of migration studies and inform decisions about how to best manage wildlife. The Migration Initiative has four main projects. The first is the Migration Atlas, a work-in-progress, which summarizes the findings of migration research coming out of the University of Wyoming. 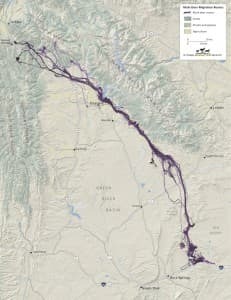 The partners in that project include text editor Emilene Ostlind, and a team of cartographers from the InfoGraphics Lab at the University of Oregon. The second major part of the initiative is the online Migration Viewer, a visual interface providing much of the data collected in dozens of radio-collar studies. With this online tool, scientists and members of the public can see animations of where individual animals traveled over time, while leaving ownership of the data to the scientists. Together, the Migration Atlas and the Migration Viewer allow for sharing of knowledge about these migrations in a way never before seen. 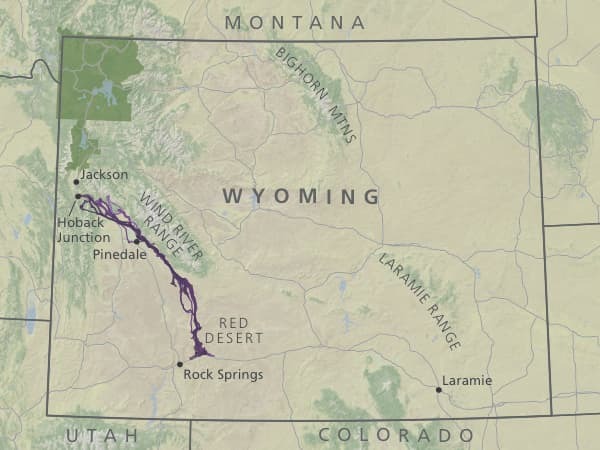 Over the next two years, Riis and Middleton will document all the arms of the elk migration, which spiral out of central Yellowstone and down its major watersheds into Wyoming, Idaho, and Montana. They plan to produce a 20-minute documentary on the subject, funded in part by the Camp Monaco prize. 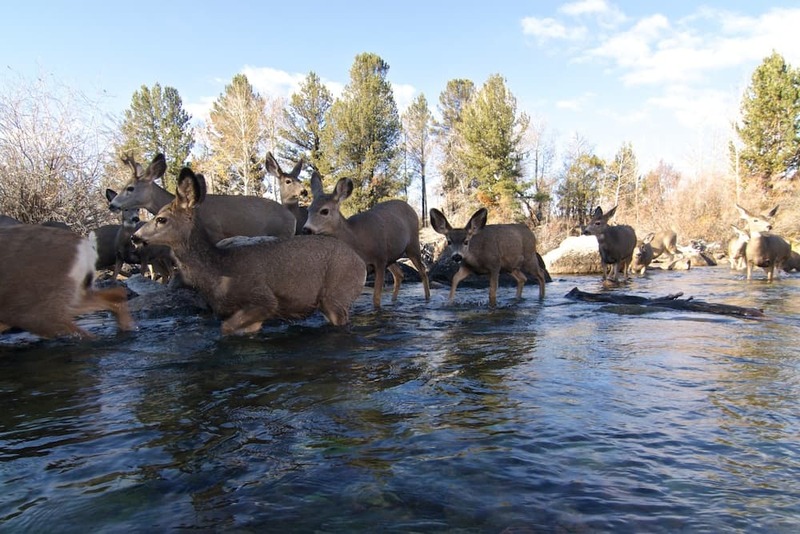 The final aspect of the initiative is a habitat assessment of the Red Desert to Hoback route, which pinpoints 10 of the major obstacles that mule deer face during the migration. The notable obstacles on the Red Desert to Hoback Route include the crossings of Wyoming Highways 28 and 352, and U.S. Highway 191. However, the most difficult obstacles are found along the Finger Lakes, where the deer must swim across water in high-use recreational areas, while negotiating dozens of fences. In some places, fences, houses, and roads squeeze the migration route down to a bottleneck just 50 meters wide. The assessment is meant to provide guidance for management agencies or conservation organizations seeking to protect or enhance the migration corridor. It could also serve as a template for future evaluations of migration routes for conservation purposes. Some of those tradeoffs relate to energy development in migration corridors. Studies by Sawyer and others show that migrating animals speed up when traveling through developed areas, like the Pinedale Anticline gas field. That can disrupt use of stopover sites, which reduces the benefits of migration. Past studies of Wyoming’s migration routes have led to advances in wildlife management. A particularly good example is the study of the Wyoming Range mule deer migrating through Nugget Canyon. For many years, the 500 deer in the herd faced a significant death toll while crossing the highway between Kemmerer and Cokeville in far western Wyoming. 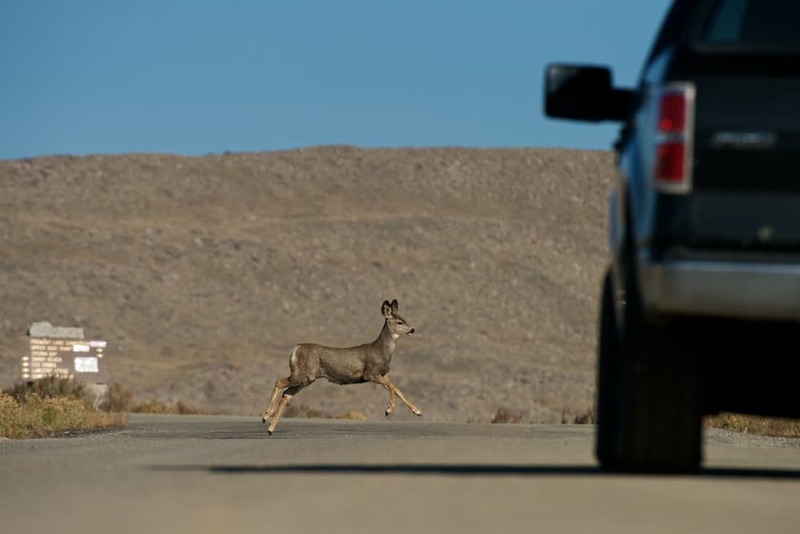 The Wyoming Department of Transportation (WyDOT) was keenly aware of the migration, as crews picked up dozens of carcasses each year, the results of auto collisions with the deer. After a failed attempt to alert drivers to slow down using flashing signs and a deer detection system, WyDOT built a deer fence and a series of wildlife underpasses to enable safe passage for deer. In total, WyDOT fenced 14.5 miles of the route and created 7 underpasses. Subsequent monitoring by Hall Sawyer and Western EcoSystem Technology Inc. showed the mortality plummet from 130 deer each year to just 10. Similarly, in 2011, WyDOT built a wildlife overpass over U.S. Highway 191 at Trapper’s Point, an area just west of Pinedale where pronghorn routinely died in vehicle collisions while migrating from winter range to summer range. That project, funded in part by federal stimulus funds, has successfully allowed safe passage for the migrating pronghorn. According to John Eddins, WyDOT district engineer in Rock Springs, such projects make sense from a conservation perspective, and also from the view of a cost-benefit analysis. 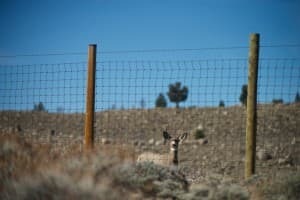 By calculating each collision to have an $11,000 cost for damage, towing, and insurance, and each deer to have a replacement value of over $2,500 to $3,000 (according to Wyoming Game & Fish Department calculations), the $4 million cost of modifying the Nugget Canyon fences pays for itself in roughly a decade. If the reproductive success of surviving deer and their offspring were calculated, the payback would come even faster. 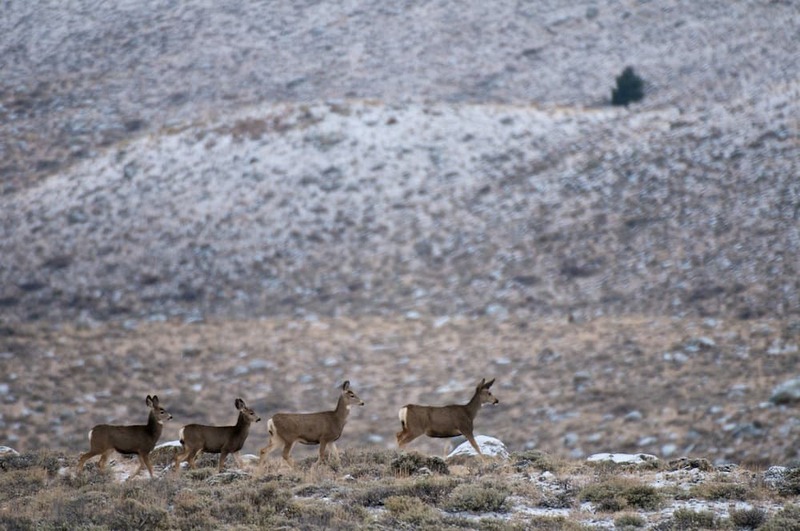 Looking forward, WyDOT plans to take steps to help the deer migrating from the Red Desert by reducing obstacles along Wyoming Highway 28 to South Pass. 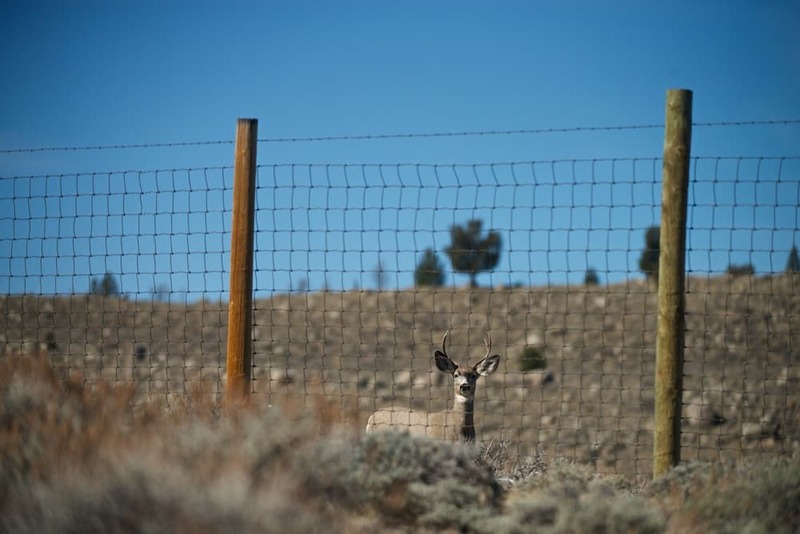 This summer, crews will lower the top-wire height on right-of-way fencing to 42 inches, so animals can jump over or crawl under the fence more easily. Sawyer noted that efforts could be made to lengthen the migration corridor to the south, across Interstate 80, which currently acts as a wall limiting the migration. An underpass or overpass would allow deer to access the southern reaches of the Red Desert, which could have less snow and increase chances of survival. Over the past several years, Kauffman has seen an increasing interest and attention focused on the issue of ungulate migration. Part of the reason is that people love to observe these big game species. Kauffman says migrations make people to think about what life is like for these animals. Sawyer agreed. “We have our stopovers, too, our hotels and favorite restaurants in the little towns between,” he said.